NEW YORK (CNNfn) - Customers are still saying yes to the best selling Ford Explorer sport/utility vehicle, but they're saying no to taking them with any kind of Firestone tire, according to some leading Ford dealers. 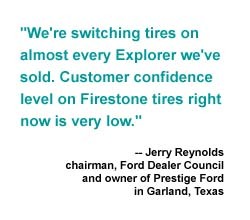 "We're switching tires on almost every Explorer we've sold," said Jerry Reynolds, owner of Prestige Ford in suburban Dallas, and one of the nation's largest Ford dealers. "Customer confidence level on Firestone tires right now is very low." Reynolds said of 40 Explorers he's sold in the last week, 38 of the customers demanded and got tires made by Goodyear (GT: Research, Estimates) or Michelin. Since the vehicles in showrooms today have newer tires not covered by last week's recall of 6.5 million tires, neither Ford nor Firestone will take back the tires being removed from the new Explorers. "We have confidence in those tires," said Jerree Martin, spokeswoman for Ford. "We're certain the population of tires affected by the problem have been identified by the recall." Related Story: Florida drivers launch class action lawsuit against Firestone. While there are other makes and models of S/UV with the Firestone tires, the recall has hit the Ford Explorer and its Mercury Mountaineer cousin particularly hard because those vehicles have an estimated 60 to 70 percent of the tires being recalled. A weekend survey by CNW Marketing Research of Bandon, Ore., of 2,414 consumers who are planning to buy or lease an S/UV found that nearly 5 percent of those potential buyers said they would "definitely" not purchase the Ford Explorer as long as it is fitted with Firestone tires, and another 11 percent said they would seriously consider another brand specifically because of safety concerns about the tires. Officials from CNW could not immediately be reached for comment. 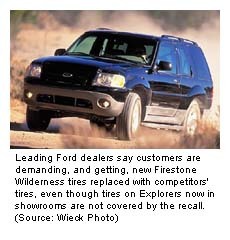 When asked what would happen to satisfy a customer wanting to buy a new Explorer that has a new version of the recalled Firestone Wilderness tire on it, Martin said, "That would be up to the individual dealers." Texas is one of four so-called hot-weather states, along with Arizona, California and Florida, where Firestone is concentrating on replacing recalled tires as soon as possible due to evidence that heat raises the threat of tread separation and tire failure on the problem models. But Reynolds, who is chairman of Ford's national dealer council, said he's hearing from dealers around the country that they're having to swap out tires. "I'd say it's safe to say the consumers here are showing higher level of concern, but I assure you, dealers all over are hearing the same things from customers," he said. Reynolds said it's mostly the 15-inch Wilderness tires that has customers concerned. But a sales manager at one of the other dealerships represented on the council said his customers are demanding and getting the same swaps on a variety of Firestone tire models. "We have had requests on all vehicles that have Firestones, asking if we could swap them out," said Bernie Wahl, general sales manager of Sunset Ford in Peoria, Ariz. "We're eating it right now, and just waiting to figure it out at a later time what to do with it." Reynolds said he'd like to see Ford or Firestone buy back the newer Wilderness tires not covered by the recall, but he believes he'll find some use for them eventually - either replacing the tires that are recalled on older vehicles or putting them on used vehicles he's selling. "Most of the cost will probably end up being labor," he said. Some dealers, especially those in more northern states, say they are not seeing the same level of concern. One said they're even telling customers no when they ask for a tire swap. "People are scared. They're asking for new tires," said Mark Ruben, business manager of Quirk Ford in Quincy, Mass. "We're just directing them to Firestone. We sell 500 cars a month; we don't have time to swap tires. We've lost very few sales because of tires." Shares of Ford (F: Research, Estimates) were off 1/8 at 29 in trading Monday. Shares of Firestone's Japanese parent Bridgestone closed at 1,875 yen, down 25 yen, in trading in Japan Monday.